The 2020 Kia Telluride takes the top spot in Kia's SUV lineup. It’s a three-row family-sized crossover that is bigger and more luxurious than the three-row Sorento. The Telluride is designed for motorists who need more of everything, and they'll get it! 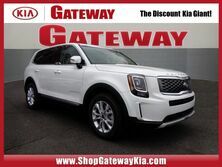 Kia packed the Telluride with innovative options and markets it as one of the largest and most powerful crossovers available. The Highlander is also a three-row family-sized crossover with comfortable seating, plenty of options, standard safety features, a solid V6 engine, and excellent reliability. However, the Highlander is not without fault. The third-row seating and cargo area are lacking space, and the infotainment system doesn't offer the popular Apple CarPlay or Android Auto. Similar to other three-row vehicles, the Telluride offers either a seven or eight-passenger seating. What determines the seating is whether or not you order the second-row captain’s chairs. The same holds true for the Toyota Highlander. Despite the captain’s chairs, the third-row shoulder room in the Telluride measures 59.9 inches, which may be a little tight with three adult passengers but it is very comfortable for two. The Highlander has 59.0. Believe it or not, another two inches would make a big difference in comfort. Nevertheless, Telluride’s third-row legroom and headroom are hard to contend with. That extra space is where the Telluride surpasses its competition. Considering the rear space, Kia designed the Telluride with a boxy tailgate and roofline. This design would seem to be deliberate for creating interior space than offering a stout look. This also explains why it has more space than the Toyota Highlander. Comparing cargo space with the third-row seating lowered, the Telluride offers 21.0 ft3 and the Highlander 13.8 ft3. When measuring an SUV of this size, the Telluride’s cargo space behind the second-row is irrelevant. There’s more cargo space than what an average person uses on a daily basis. See our comparison chart below, and our 2020 Kia Telluride vs 2019 Toyota Highlander Pros and Cons article on the next page. 2020 Kia Telluride: Technology, power, comfort. As we stated in other articles, the 2020 Kia Telluride takes the top spot in Kia's SUV lineup. It’s a roomy three-row crossover designed for motorists who simply need more. The Kia Telluride and Hyundai Palisade share the same powertrain -they are well-powered cousins. Each vehicle’s tuning and driving experience slightly differ, but in a way that doesn’t detract from their performance. For instance, the Telluride’s 291 horsepower is amongst the strongest in the SUV market. Surprisingly, it also has one of the lowest base curb weights, which translates into better acceleration. On the other hand, the Toyota Highlander offers a strong V6 engine and sufficient fuel economy, but its four-cylinder trim model has weak power delivery. A weak SUV is not favored by any consumer. Lastly, the EPA estimates of the front-wheel-drive Telluride averages 20 mpg city, 26 mpg highway, and 23 mpg combined. Obviously, the all-wheel-drive estimates are lower at 19 mpg city, 24 highway, and 21 combined. All-in-all, EPA estimates are within range of other crossover SUVs on the market. Also, the Toyota Highlander offers 4, 6, and 8 cylinder trim models each having a similar fuel economy. On average, a driver will see 20 mpg city to 27 mpg highway. Strange there’s not much difference between the engine options. Below is our Pros and Cons chart showing points of interest that are most popular with drivers. Our decision may seem biased, but we believe the facts show the 2020 Kia Telluride as a better buy than the 2019 Toyota Highlander. Kia placed an enormous amount of energy into pushing the bar in the SUV marketplace, and Telluride is the result. 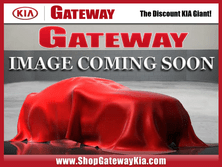 If you're searching for Kia dealers in PA and live close to Gateway Kia Quakertown near Philadelphia, call us and schedule a test drive with one of our sales associates. They’ll be happy to answer all your questions and help you find a Kia vehicle that fits best for your needs.